Heads up for the Canadian ladies out there, if you've got a Rexall near you, all lipsticks and lip glosses are 50% off Jun 12 - 18, 2010. Check out the flyer here. Alrighty, here's ch3rryco1a's pick. The 11th pick for Round 2 of Pick My Polish. This is a re-swatch. My first swatch turned out wicked bad. This time I'm wearing it for a full mani. But to check out the original review, go here. But here's a tiny recap of the colour. Deep purple polish with silver (which shows up more purple/pink) and blue glitter. It's not very blingy and much darker than the bottle. And here are two pics. One taken with an ott lite and one taken in direct sunlight. This is for those who asked to see what sort of difference there might be. You can see with an Ott Lite, it really concentrates the light in one area, so it's darker in the periphery whereas in direct sunlight there's much more light everywhere. But as far as colouring goes, they're both pretty accurate. This is three coats again. And with topcoat this time. But I did a nice even semi-thick first coat and two thinner coats to even things out and such. Doesn't look watery anymore. Now here's a random pic of me. I kept meaning to get stash pics, but never got around to it. So here's a semi stash pic. I pulled all my polishes out to pick which ones I would take to do manicures for women's retreat and so I'm sitting here surrounded by all my polish. I'm making a franken, I think. I'm totally wearing sweats and plaid. I feel like a slob. I love this type of shade. I've just realised that I inadvertently have at least 4 purples with pink and blue shimmer. I don't think I need this one. 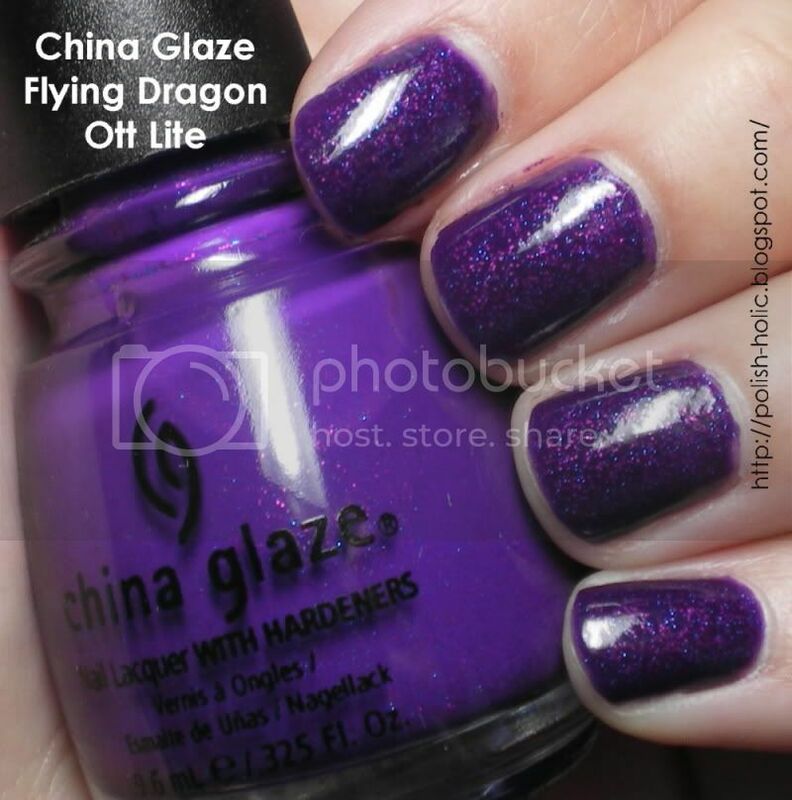 I love Flying Dragon but it wasn't quite blingy enough for me so I topped it with a glitter topcoat. Perfection! Curious how the polish looks considerably darker on nails. And so different. It's like you're holding the wrong bottle you know. this china glaze similiar with nfu oh 51 ? Hahahaha you're too cute. I loves you. Rebecca: I never think I do, but I end up with new polish anyway. Lol. amusedPolish: Hahaha, that would have been StBFF's doing. I picked those to take with me and she lined them up. They really do look like army formation. Alisa: Nice! Yeah, I expected this to be blingy-er. jellynat: Yeah, it's really odd. RBL polishes are like that too. And thank you about my header. Agreed, most people own maybe 10 bottles. We have a sickness, Nat, we really do. Lol. ipehishere: 51 has more red, and is a flakey, not much blue in 51 either. But 51's a nice one. I must say I like that you're wearing something comfortable when you're playing with all your polish. It's such a clash. And thanks again. 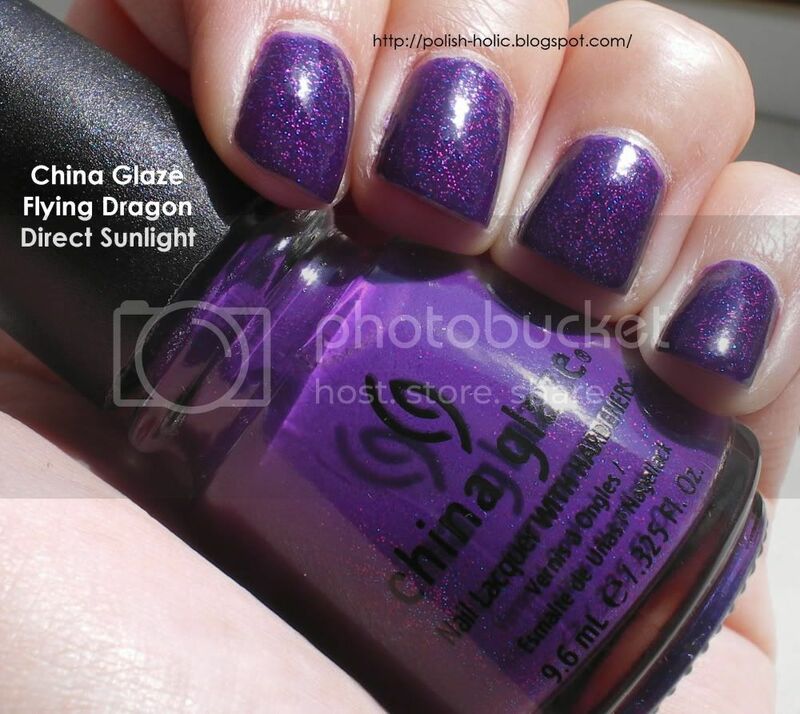 I think this polish can look great depending on application and light. I have both sides on my blog. Lol.